The protests have turned violent in several parts of the country. 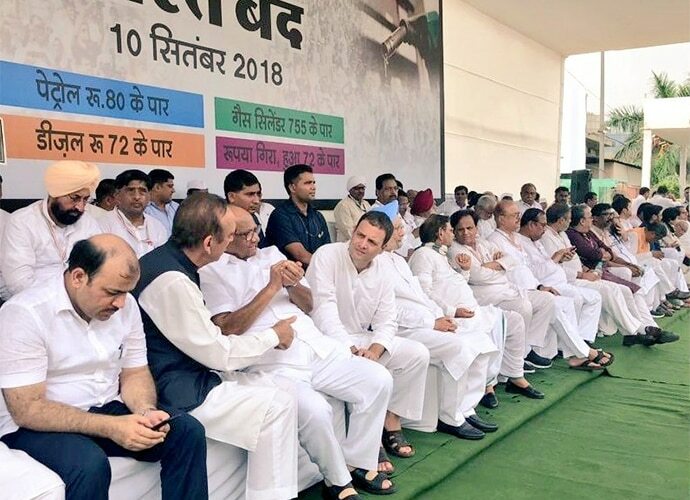 The Opposition parties have finally hit the street protesting the unabated rise in petrol and diesel prices, calling a Bharat Bandh. Among the demands that have been raised are an immediate reduction of central excise duty and excessive VAT in the states, bringing petrol and diesel under the ambit of GST. Congress president Rahul Gandhi, who is leading the nationwide shutdown, questioned Prime Minister Narendra Modi's silence on fuel prices and the Rafale fighter jet. At least 22 opposition parties are participating in the shutdown. Delhi's ruling Aam Aadmi Party (AAP), which had refused to join the bandh earlier, also sent its leaders. Top opposition leaders like Sharad Pawar, MK Stalin and Left leaders have supported the bandh, while Mamata Banerjee's Trinamool Congress has decided to stay away. Former Prime Minister Manmohan Singh, who joined in the protest along with Congress leader Sonia Gandhi at Delhi's Ramlila Grounds, said: "The Modi government has done a number of things that were not in the interest of the nation. The time to change this government will come soon." The protest also turned violent in certain parts of the country with people damaging public property, buses and cars. In Bangalore, anticipating trouble, schools and colleges were shut down. The decision to shut schools and colleges was taken after the Karnataka's ruling Janata Dal Secular, which is in alliance with the Congress, said it would support the day-long protest. There were reports that a two-year-old girl died after her ambulance was not allowed to reach the hospital in Bihar's Jehanabad. Train and road traffic were reportedly affected in many parts of Bihar. Over a dozen long route trains had to be stopped at Patna, Gaya, Bhojpur, Jehanabad, Bhagalpur and Muzaffarpur railway stations.